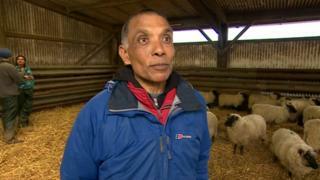 Image caption Sivalingam Vasanthakumar believes the lambs will be "looked after well"
Mr Vasanthakumar, a farmer for 47 years, said: "I just couldn't cope any more and I had to say no." Mr Vasanthakumar said he had previously worked as a dairy farmer with his parents in Sri Lanka but had also been a farmer in the UK for "many years". "It was taking them to the slaughterhouse and that was stressing me out a lot," he said. Mr Vasanthakumar said he also hated to see the "animals going through that stress". "I realised this year, I couldn't do it. The emotional toll had become too much," he said. "I will still be in the farming world, but not livestock farming anymore," he said. Sanctuary manager Dave Bourne said there were only a "handful" of sanctuaries the UK that rehomed rescued farm animals.